Ceek is a company that sells all kinds of beautiful bohemian jewelry. 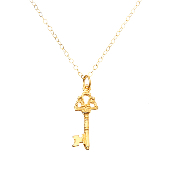 For my review, I was sent the gold key to my heart necklace which retails for $55. I love the necklace! It is classic enough to be able to wear it to work but fun enough to be able to wear on a date (I wore it for my two year wedding anniversary Monday night!). I've been wanting a key necklace for some time now and this one is perfect! Here is some information about the company: As two savvy fashionistas, Esther Kim and Carter Ellingson are on the forefront of the fashion know. Ceek, an acronym for Carter Ellingson and Esther Kim, was founded in 2010. What started as a friendship and shared love for accessorizing, grew to a business partnership and a love affair with jewelry. A juxtaposition of dainty and bold – Ceek equally represents the personalities of its two entrepreneurial owners. Along with the classic type necklaces, the company also sells really funky jewelry like cuff bracelets and long earrings. I think that most people would be able to find a piece that they love from here! 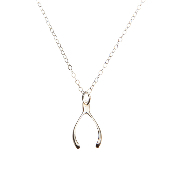 The giveaway will be for the silver wishbone necklace seen above from Ceek Jewelry! The giveaway is open until Midnight on Tuesday July 26th. Winner will be chosen on Wednesday July 27th using Random.org. The winner will have 48 hours to respond or a new winner will be chosen. Visit the Ceek website and let me know which piece of jewelry is your favorite! Subscribed your blog via email. Rectangular statement is my best necklace. Facebook Liked You and Subscribed by email. i love the crystal feather pendant! I like the oval art deco earrings. I love the gilded bone feather necklace! Liked the Art Deco Ring at Ceek. Luv everything!! I'm your newest follower! I like the Crystal Leaf Pendant necklace. I like the shooting star necklace. thank you! Love the Infinity Hinged Ring. I like the crystal feather pendant. I like the Crystal Dragon ring ! Its awesome and so unique! I liked her Luna necklace, but honestly, I liked your necklace the best! I like the Crystal Leaf Pendant. I really love the Crystal Dragon Ring! I like your Facebook page under Kayla P.! My favorite is the Gilded Bone Feather & Turquoise Necklace. The amethyst crystal ring is my favorite. 1. I like the Nutritionist Reviews on facebook as Alison Faith Tolar. 2. I like the Nutritionist Reviews on facebook as Alison Faith Tolar. The wishbone necklace is actually my very favorite but I do really like the peace necklace as well. I also love the Love Tag Necklace in Gold. I love the Chain Fringe Bracelet! I love the Lucky You Shamrock necklace! I like the Twisted Pearl and Chain Bracelet. I'm usually an earring person when I browse jewelry websites but Ceek's necklaces lead me elsewhere. I really like their Crystal Feather Pendant. It has a lovely art deco feel to it and can be worn with formal or casual attire. I like the Gilded Bone Feather & Turquoise Necklace. I love the Mini Stone Cross necklace. I entered your Helps Tea contest. I would like the Twisted Pearl and Chain Bracelet. The Oval Art Deco Earrings are my favorite. My favorite piece is the Oval Art Deco Earrings. How beautiful are those! I love the Clear Crystal ring. I follow via. google friend connect. i like the spike bib necklace! I like the Evil Eye necklace. I'm a bit of an earring fiend and the Oval Art Deco Earrings would be awesome! My fave is the Dagger Pendant necklace, love it! Thanks. I like the Crystal Dragon Pendant. I love the shamrock, the horse shoe, and the wishbone. I could use a little luck!